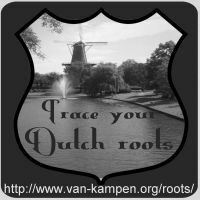 The fourth issue of the quarterly Trace your Dutch roots newsletter is almost ready for sending. The topic of this issue is the 19th century. The newsletter discusses topics like emigration in the 19th century, the impact of the secession of 1834, and finding your 19th century ancestors. Subscribe today if you want to receive this issue by e-mail. Previous newsletters are still available at the newsletter archive.